My Microsoft Edge beginners guide is intended to help you become proficient with Microsoft Edge quickly and easily, assuming no prior knowledge. Many people think they know how to use Microsoft Edge. But to really master Edge, you need to look just a tiny bit further. There’s stuff that you can do which will make your life easier and the good thing is: it’s really not hard to learn You also don’t need a lot of time to figure it out. But if you set aside just a few minutes to look at the possibilities, you’ll win that time back many times over by working more efficiently. The goal of this article is to give you an introduction to Microsoft Edge and an overview of the possibilities, along with the information you need to access the rest of my Microsoft Edge free tutorials. You can start reading right here and at the bottom of this page you’ll find an easy-to-use signup form that you can use to sign up for the rest of my complete Microsoft Edge beginners guide. Don’t worry, it’s completely free. (Or you can look for the Microsoft Edge beginners guide articles on my website and simply follow the links, but that can be a little more overwhelming). The new Microsoft Edge internet browser is the successor to Microsoft Internet Explorer and aims to be more than just a standard web browser. That’s why it pays off to take a deeper look into the features that are available to you. With my Microsoft Edge beginners guide under your belt, soon you will be the one people will want to see in action to learn new computer tips and tricks that will save them time and make things easier. So let’s get started with your Microsoft Edge beginners guide and find out more on how to launch (or open) Microsoft Edge. First, start Microsoft Edge by double-clicking the Microsoft Edge icon on your desktop or you can also click the Edge icon on your taskbar. (Please note that you only have to click once on icons in the Windows taskbar. A double-click might cause the program to open twice, in 2 separate windows, which can cause confusion). Doing so will cause Microsoft Edge to launch and take up most or all space on your screen. In the image below, you can see that Microsoft Edge takes up the entire desktop (full-screen mode) and that the controls in the upper right corner show the “restore down” help tip when hovered over with the mouse. That means that Microsoft Edge is displayed in “full screen” or “maximized” mode and covers the entire area of the screen. The fullscreen mode of Microsoft Edge's window is not to be confused with Microsoft Edge fullscreen mode on itself (where the tabs and menu icons disappear to make more display space available for the actual content of the window). Microsoft Edge's predecessor, Internet Explorer, has a fullscreen toggle hotkey. Pressing F11 on your keyboard will do the trick for Internet Explorer to switch to fullscreen, but not so for Microsoft Edge. In order to toggle Microsoft Edge on and off fullscreen, you need to press the Windows key, SHIFT key and ENTER key simultaneously. Pressing that keyboard combination repeatedly will switch on and off Microsoft Edge fullscreen mode. With that said, let's continue the Microsoft Edge beginners guide. You can switch to the “restored down” mode by clicking the restore down control in the upper right corner. You will then see how the Microsoft Edge window shrinks to a smaller size, revealing part of your Windows desktop area, like in the image below. Also note how the middle one of the three controls in the top right corner now shows a “maximize” help text when hovered over with the mouse. You can toggle fullscreen mode on and off with this, but let’s continue on in fullscreen mode and proceed with the Microsoft Edge beginners guide. Let’s take a look at some of the features. The first page that Microsoft Edge will pull up when you open it is not an actual web page, but rather a customizable home page for you. It is split up into several sections, showing the latest news, the current weather in the area and the latest sports tickers. In the Microsoft Edge window, you’ll notice the address bar, the search bar and also the customize gear. If you click the customize gear, you’ll go to the customize section, where you can change the language (if you happen to be in an area with a different language). You can also switch on and off several information cards by clicking on the switches. I see a lot of people who prefer to have Google as their Microsoft Edge start page rather than the customizable home page, so later on I’ll show you how to do that, but before we get to that, let’s also take a look at some of the other Microsoft Edge settings. To access the settings in Microsoft Edge, click the three dots near the top right corner, scroll down to the bottom of the menu and click “settings”. The first thing Microsoft Edge has in “settings” is about themes. You can switch between light and dark, depending on your preference or how your eyes adjust (maybe at night you want to use a dark theme). Another setting that you can toggle on and off by clicking the switch in Microsoft Edge’s settings is whether or not you want to display your favorites bar. I’ll talk more about using favorites further on, but here’s where to hide or show your Microsoft Edge favorites bar. 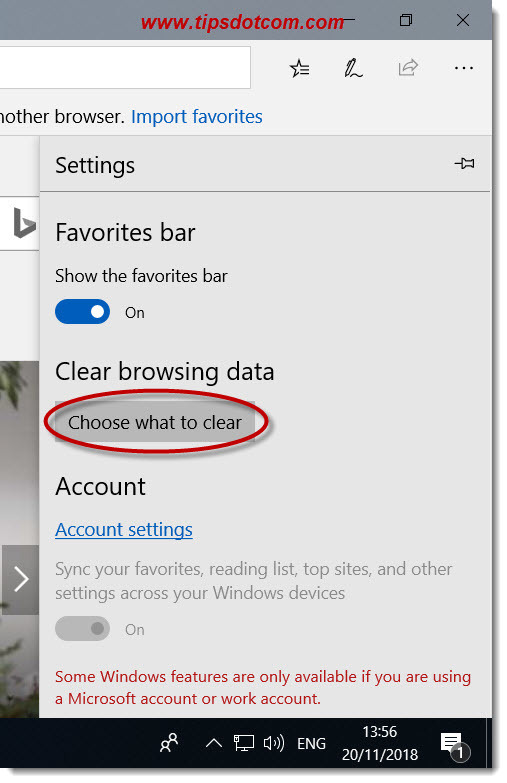 Microsoft Edge also offers you easy access to clearing your browsing data. 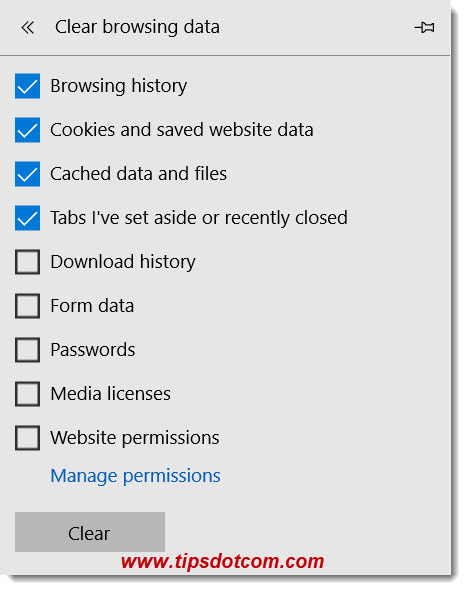 You’ll find the button to clear your browsing history in Microsoft Edge right in the settings menu (see image below). The text on the button to clear your browser data already gives away that you can choose what kind of internet history you want to wipe. The image below shows the different types of data that you can erase. I’ll go more in depth about each specific option in separate articles, but for now I want to focus a little bit more on a higher-level view in this Microsoft Edge beginners guide, just so you can cover more ground. If you scroll down a bit more in Microsoft Edge’s settings, you’ll also find a button that will take you to the more “advanced” settings. 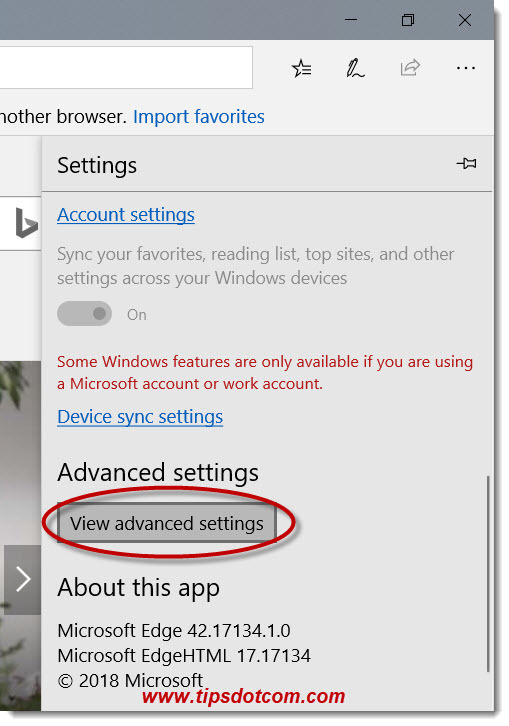 Advanced settings in a Microsoft Edge beginners guide? Not to worry, let’s just take a quick look at them for now. The first thing you find here is a switch to toggle the “home button” on or off. The home button is the icon that looks like a home in Microsoft Edge and is a button to take you straight back to Microsoft Edge’s start page. A lot of people prefer to have the home button so they can quickly get to their start page, regardless what web page they’re currently looking at. 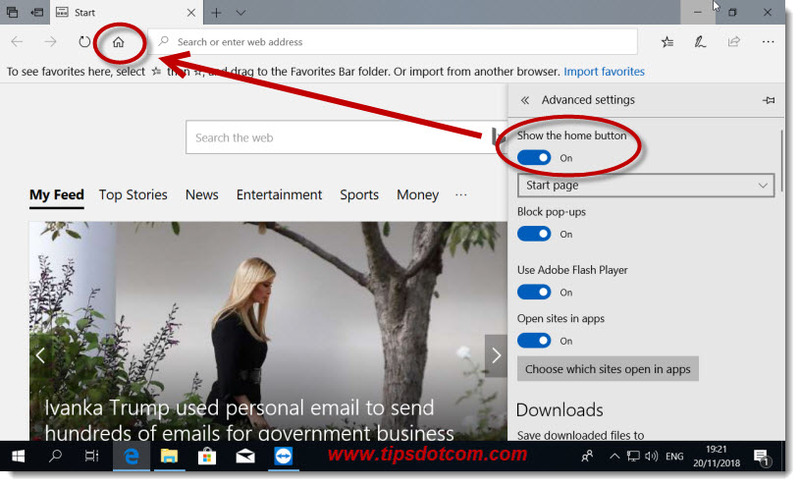 If you find your Microsoft Edge home button missing or your Microsoft Edge home button disappeared all of a sudden, this is where you need to look. Other settings that you’ll find in the Microsoft Edge advanced settings include blocking popups, toggle Adobe Flash Player on or off, choose which sites open in apps and more, like shown in the image below. Then, if you scroll down a bit more in the Microsoft Edge advanced settings, you’ll also find settings to save passwords, form entries and cards in Microsoft Edge, as well as a number of privacy settings and track requests. As you can see, there’s a lot more to using Microsoft Edge than first meets the eye, and if you continue to scroll down in the advanced settings, there are some other interesting things like the options that control how your internet searches are carried out. This can have a huge impact on how efficient you will be when searching stuff on the web. For that, I have a whole separate section available for free that explains exactly how to optimize your computer’s internet search behavior so you will get the results you want. Be sure to also follow my articles with more computer tips and tricks for searching on the internet with Microsoft Edge. That concludes the general gist of the settings in Microsoft Edge.